Some of you may have already seen my stories in Cycling Active and Cycling Weekly and also on-line on the London Cycle Sport website. 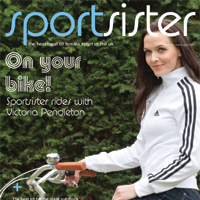 As well as these publications I have now started doing features for Sportsister, a sports magazine for women. I think this is a great idea for a magazine. Even in this day and age people seem to think that women aren't that bothered about sport. Wrong. We are but it's not always easy to get involved and get the coverage when the various sports disciplines are so male dominated. Women's sports receives less media exposure and sponsorship sport can be quite lean as well. Anyway, this magazine, which was the idea of Danielle Sellwood and Louise Hudson is great for raising the profile of what women do across the various sports. Of course they cover cycling, but they also cover all other sports. Through Sportsister I have had the chance to take part in a few events on their behalf and write event reviews. I was recently at the Cycletta South event, and my next challenge will be to do the Royal Parks Half Marathon. I guess that as well as being able to write I need to be fit! So, after a 5 year absence from any sort of long distance running I will find myself lining up in Hyde Park ready to put myself through 13.1 miles of London Parks. Hopefully I'll get round it before they take down the event hoardings and the marshals go home! In any case, there will be a story from me about the race. I look forward to writing more stories and sharing creative ideas with Danielle and Louise.